When Will I Get My A2 Envelopes? 5,000 and under A2 Envelopes: Ships or ready for pick up in 2 business days from proof approval. Over 5,000 A2 Envelopes: Ships or ready for pick up in 5 business days from proof approval. When you want an invitation or announcement to deliver a positive image beginning with the envelope, then choose 48HourPrint.com for your A2 envelope printing. You can be confident that the recipients of your mailing will be impressed with our A2 envelope printing. You get the peace of mind of great quality online envelope printing services that are easy on your budget. Printed A2 envelopes are perfect for pint-sized promotions and mailings! Use A2 envelope printing to create envelopes for announcements, invitations, standard postcards, note cards and small greeting cards. 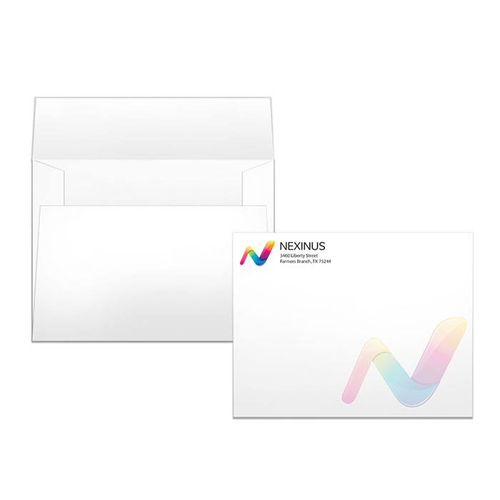 These versatile 4.375” x 5.75” envelopes with your full-color logo and return address are great to have on hand for any number of mailings. Be prepared and stock up. In addition to A2 envelope printing, our online envelope printing services include #10 envelopes, #10 window envelopes, #9 envelopes, A6 envelopes, A7 envelopes, A9 envelopes,9x12 envelopes, and 10x13 envelopes. For more envelope promotional tips, check out our envelope marketing ideas . Also review our envelope templates for layout guidelines that will help keep your print job on schedule.